When a portal to another world is discovered in the forests surrounding Mt. Fuji, the Japanese government makes an effort to corner the market on exports to the Holy Eldant Empire while keeping the discovery a secret. After several failed export attempts, they’ve figured out what the Eldant’s want – entertainment. More specifically they want manga, anime, and light novels. It’s going to be Shinichi Kanou’s job to figure out how to get it to them. There are language barriers to be crossed, politics to be waded through, and Shinichi isn’t sure if he’s been hired by the government or straight up kidnapped. Outbreak Company Vol 1 begins with a lighthearted, humorous tone, something I expected with the genre and synopsis. As the light novel continued, the humorous situations began to take on a more serious tone leading up to a tense climax. And it is in its more serious moments where the book really shines. In many ways, this is the story of the daily life of Shinichi as he tries to introduce Japanese culture to the medieval, magic wielding citizens of The Holy Eldant Empire. Major setbacks begin accruing before he’s even hired for the job, though, and Shinichi quickly realizes that this isn’t going to be any walk in the park. Eldant doesn’t share either a written or spoken language with Japan. There are no translators available, and the magic which allows people to communicate relies on telepathy and mind reading, something which cannot be used to translate previously recorded media. The major problems inherent to bringing a foreign culture to a wildly different society are delved into rather deeply, much more so than I initially expected. Despite the light novel’s cover image and the subtitle reading ‘The Power of Moe’, the fan service and what I imagine will eventual become a harem scenario are no where near as egregious as many other isekai. Only two female characters spend any sort of quality time with Shinichi. Each has very real reasons as to why they admire him and want to spend time with him. This isn’t simply plot convenience and happy coincidence. Extensive characterization and development take place for all three, something not always found in similar stories. It isn’t hard to see why the peoples of Eldant are drawn to Shinichi either. He’ very different from them, an oddity. This is a society based on magic with a medieval social structure. Modern philosophies Shinichi takes for granted aren’t even discussions among the learned let alone practiced. Equality and freedom are foreign. These differences play an integral role in character relations, world building, and plot. The clash of culture is evident here. Humorous situations quickly become serious. Many of Shinichi’s strengths are characteristics gleaned from his consumption of media. Having parents that are light novel authors and video game designers means Shinichi has been exposed to a very wide variety of manga, light novels, anime, and video games since birth. When confronted with a brand new world he is understandably in awe. There are times he’s left in wide eyed wonder at the prospects of another world, or else left a frightened mess upon finding the very real, very frightening looking creatures found there. Yet, what we see most often is a cool analysis that doesn’t seem at all out of place for such a character. Upon first waking in a new place, Shinichi analyzes the architecture, gleaning an impressive amount of information about what that says about the place he’s in. When the maid in the room beings speaking Shinichi rattles off what languages she definitely isn’t speaking before realizing that he has no idea what language this could possibly be. Written language, too, gets this treatment before Shinichi admits that it doesn’t look like anything he’s seen. Shinichi has clearly learned quite a bit from his consumption of various media. I’ve very rarely seen this knowledge of various cultures and histories via video games and books so blatantly visible and celebrated in a book. This is something that is undeniably true, at least for some. Having an interest in fantasy, for example, inevitably leads to a deeper knowledge of medieval society and defensible castle design than one would expect. Shinichi is clever, and for a reason. Manga, anime, and light novels are spoken of with a sort of reverence. Sure, there are funny moments that play on standard tropes, but these are tempered very well with Shinichi’s sheer pride in manga, anime, light novels, and video games and why they should be celebrated. Even with the Empress’s enthusiastic embracing of Japanese pop culture, distributing the things he loves so much is still a very uphill battle. The heroes whose stories we gravitate to, the stories of people fighting for justice and overcoming oppression simply don’t translate well to a society that still uses a caste system, has a low literacy rate, and bears deeply ingrained, unquestioned racism. The Eldants simply have no context in which to place these characters or understand their motives. This is an uphill battle and learning process, but one Shinichi tackles with both passion and logic. Events really ramp up towards the end of the novel. The pacing is faster, events grow much tenser, and a more slowly paced slice of life isekai develops a politically motivated plot with a good dose of action. Honestly, I hadn’t quite expected this turn, so much so that while I was completely on board for the change of pace, I couldn’t quite understand the change. Yet the motivations of characters begin to come to light, and Shinichi finally puts all the puzzle pieces together. I won’t get into this too much here as I want veer away from spoilers, but rest assured that this doesn’t stay slowly paced. The next volume is set up to have a much more complex plot with a lot of political intrigue with both personal and widespread consequences. 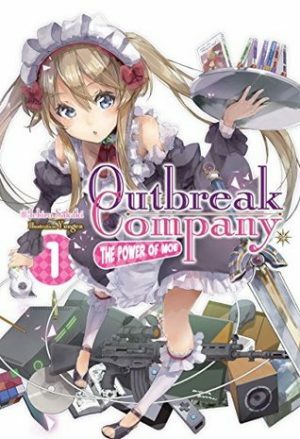 I am really looking forward to the second volume of Outbreak Company Vol 1 by Ichiro Sakaki. The series is fun, and surprisingly serious. If you are a fan of isekai, I would definitely recommend picking up this series.